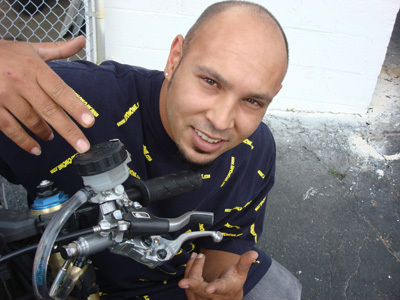 Fullthrottleinc is one of the top names in the handbrake business. The owner Bill, was kind enough to supply us with 2 basic HB kits ($245) and 2 Nissan front masters ($130) for the UpOnOne.com bike build. Made from a solid block of aircraft aluminum, these master cylinders are a magnificent piece of engineering. The newest model now comes with an additional bleeder screw mounted on the rear master that makes set-up even easier. 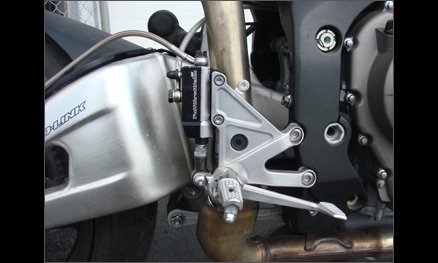 After installing the unit, my rear brake feels twice as good as it did with the stock master. The front Nissan master is as Bill states, "the best possible solution for a front master in terms of quality and price". Not only is the front master smaller in dimension than most (which makes mounting much easier), the half-inch bore offers the best feel and stopping power. Installing the kit was fairly simple. I suggest that you follow the installation instructions that Fullthrottleinc provides for the system to work it's best. It took me about an hour to install the kit and bleed it. It looks awesome mounted on the bike! For my money, this is by far the best possible HB kit available to those looking for quality, reliable equipment. Fullthrottleinc now also offers a smaller budget kit that works equally as well and is definitely a better alternative to the lower quality products available on the market right now. The Super Duty kit ($120 with a brake line, $65 without) comes with a leak proof adapter that mounts to your stock master and offers the exact same feel as the higher end handbrake kit.